This millennium Jefferson nickel is only one point away from perfect. Sharp strike, bold details and awesome frosted deep cameo. Slabbed by Numistrust corporation. 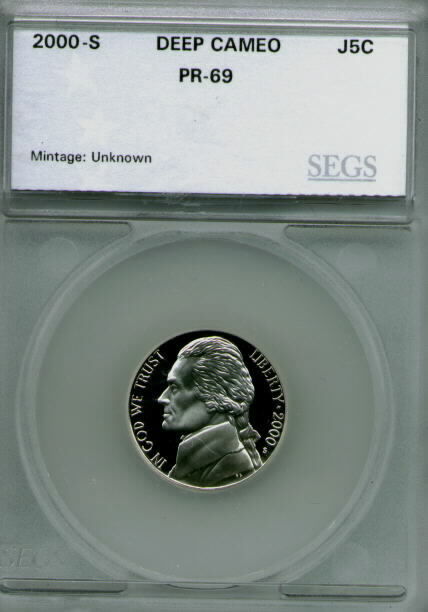 A Jefferson nickel that is graded only 1 point away from being perfect from SEGS. A very pleasing example with mirrored surfaces and frosted white cameo. A nice piece to add to any collection. 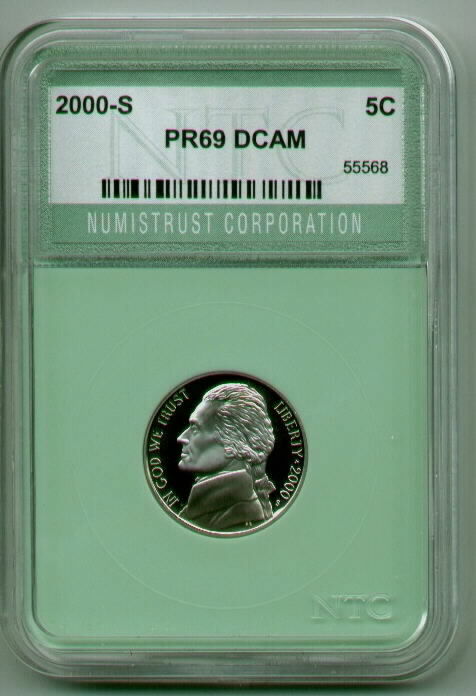 This certified nickel is in a NGC holder. 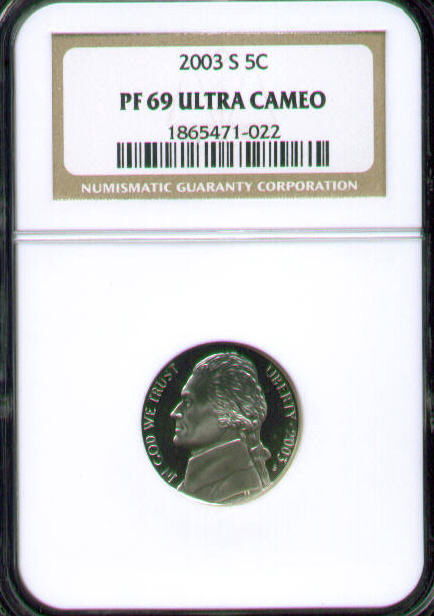 Numismatic Guaranty Corporation gave this coin a proof 69 Ultra cameo. If you are one of those people that expects nothing less then the best, then this coin is for you. 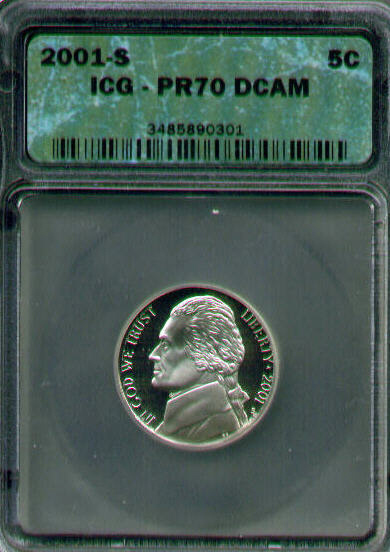 ICG gave this coin a grade of Proof 70, (perfect)!! Another great looking certified coin. 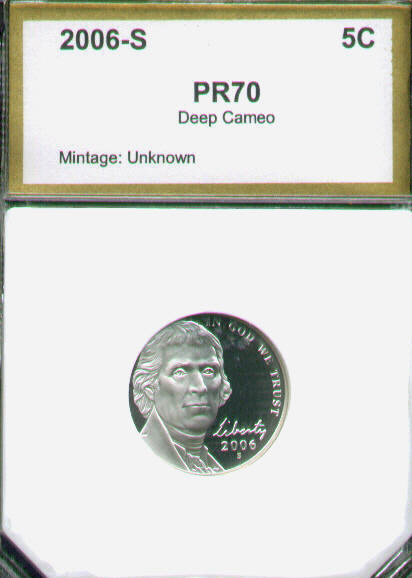 This is a 2001 proof-69 Jefferson nickel with frosted deep cameo. Graded and authenticated by NTC. ...same as the one listed above except this is 1 point higher at Proof 69. 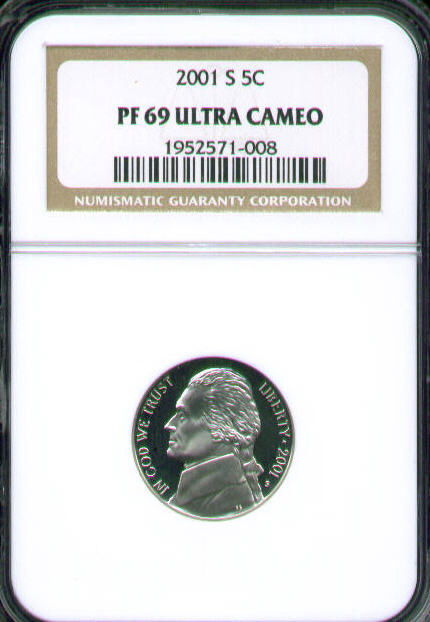 This coin is also graded by NGC. This beautiful coin would make a nice addition to any Registry set. 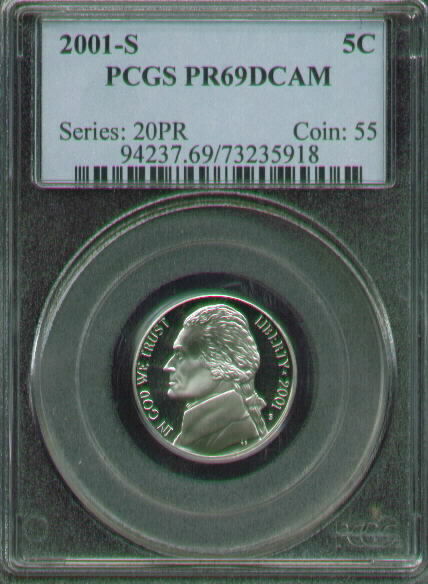 It's graded by PCGS as proof 69 deep cameo. 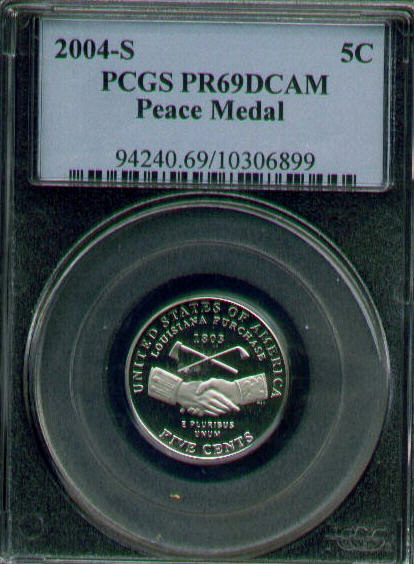 Another eye smashing perfectly graded coin by ICG. CoinWorld trends this at $75.00 but here it's only 19.99. 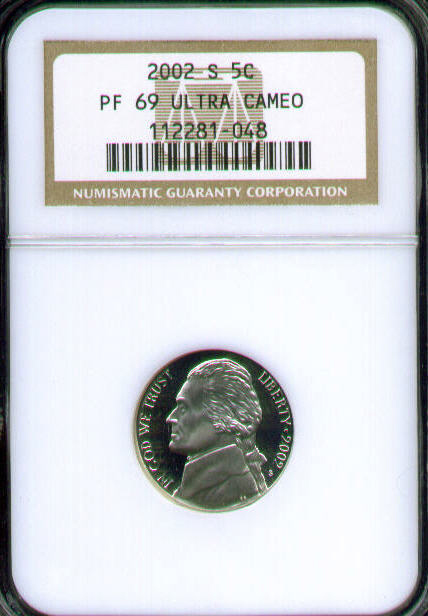 Here we a 2002 proof nickel in a NGC holder, it is graded an ultra high grade of Proof 69. Awesome mirrored fields and frosty white cameo. Another beautiful coin graded and slabbed by NGC. 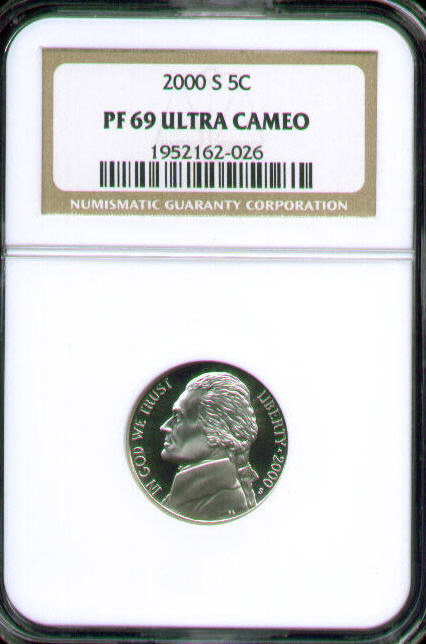 If you are putting together a NGC Jefferson Nickel registry set. We currently have one for each year available from 1990 to 2003. All at under 20 bucks each. This beautiful coin would make a nice addition to any Registry set. 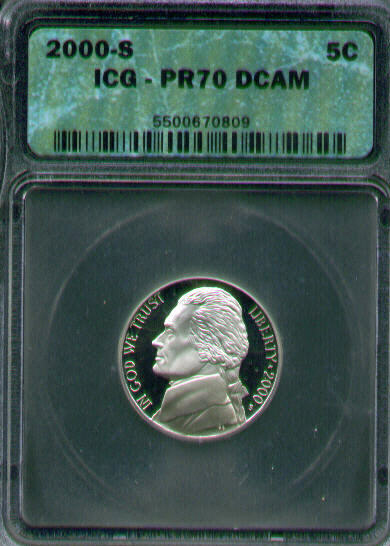 It's graded by PCGS as proof 69 Deep cameo. It was the first of the two different reverse that year. It's referred to as either (Handshake or Peace medal) reverse. 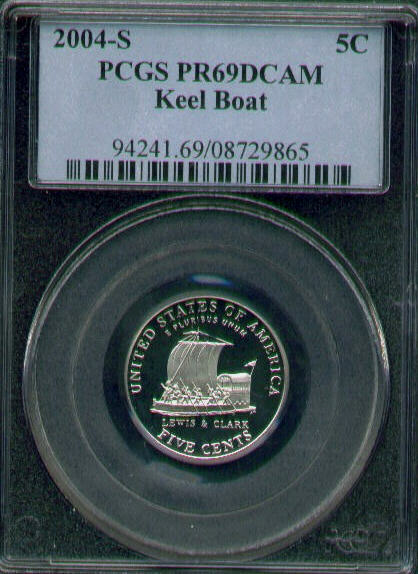 A excellent example of a PCGS proof 69 deep cameo Keel Boat nickel. It was the second of the two different reverse that year. This beautiful coin would make a nice addition to any Registry set. 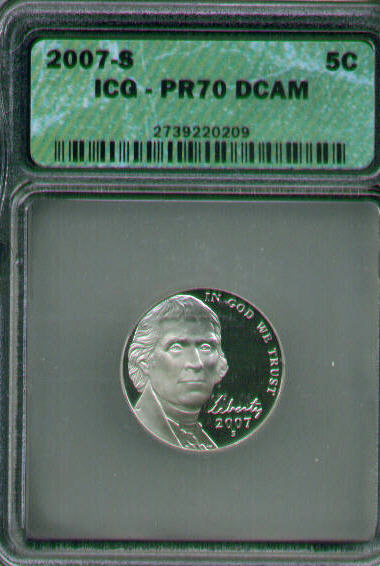 Another nickel that was taken out of a Special Mint Set. This was the second one made that year called the "ocean view". 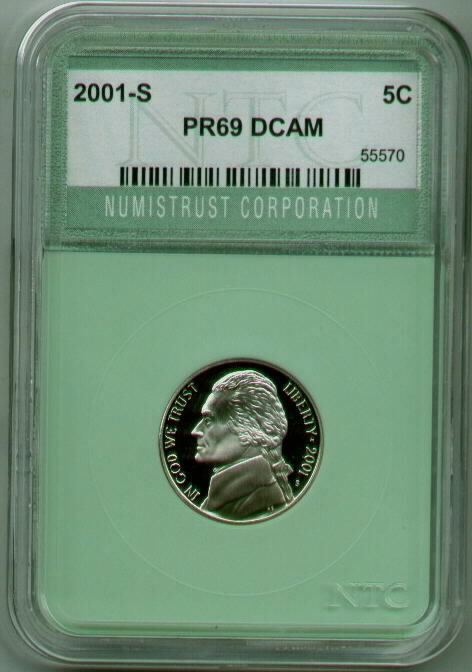 It was also graded Mint State 67 by NGC. Another eye smashing perfectly graded coin. This "return of the Monticello" is graded Proof 70 by PCI. If you are one of those people that excepts nothing less then the best, then this coin is for you. 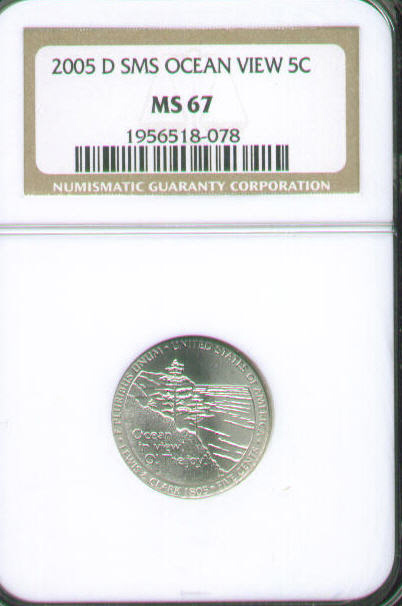 ICG gave this coin a grade of Proof 70, (perfect)! !